You may want to pass on card processing charges to customers that wish to pay by credit or debit card. 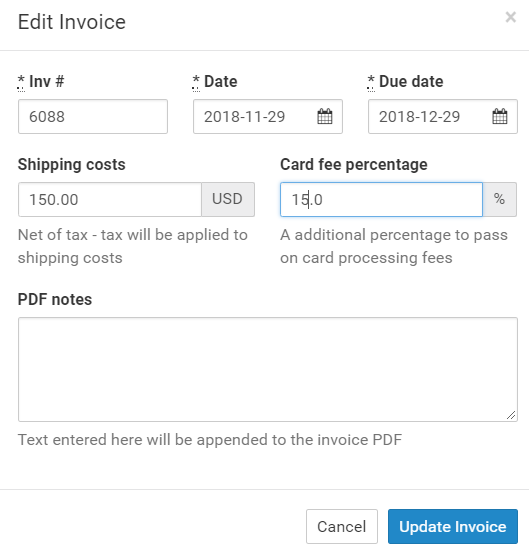 For any invoice, you can add a card payment charge as a percentage increase to the invoice total. In addition, for any customer, you can specify a default percentage charge to add to all new invoices created for that customer. Click the edit/pencil icon at the top right to edit the invoice. 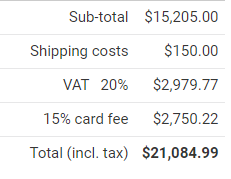 Note that card fees do not include tax/VAT. If a customer always pays by card and you always charge a card payment fee, you can specify a default card fee percentage for all new invoices for that customer. Navigate to the customer from the Contacts/Customers menu option on the left main vertical menu. Locate and select your customer (search or scroll through list). Click the edit button to edit the company details. 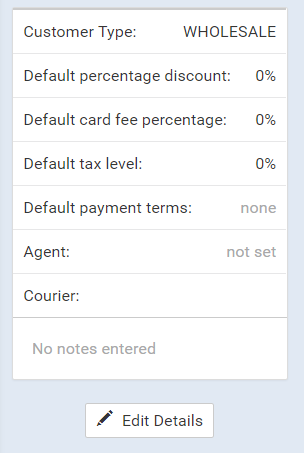 Enter a percentage amount into the "Default card fee percentage" field. Now all newly created invoices for this customer will have the default card fee automatically applied.